The GO! Outfitters Camping Hammock takes their basic hammock and adds a few features, including an integrated zippered bug net for built-in mosquito protection. The overall design and function of the GO! Camping Hammock is similar to the basic hammock, with the addition of the bug netting, and slightly narrower dimensions (you won’t notice in practice). The hammock also features fabric tensioners on the bug netting to help keep the fabric pulled out and away of your head. Stakes and shock cord on the outside fabric is an add-on feature to pull out the hammock fabric. 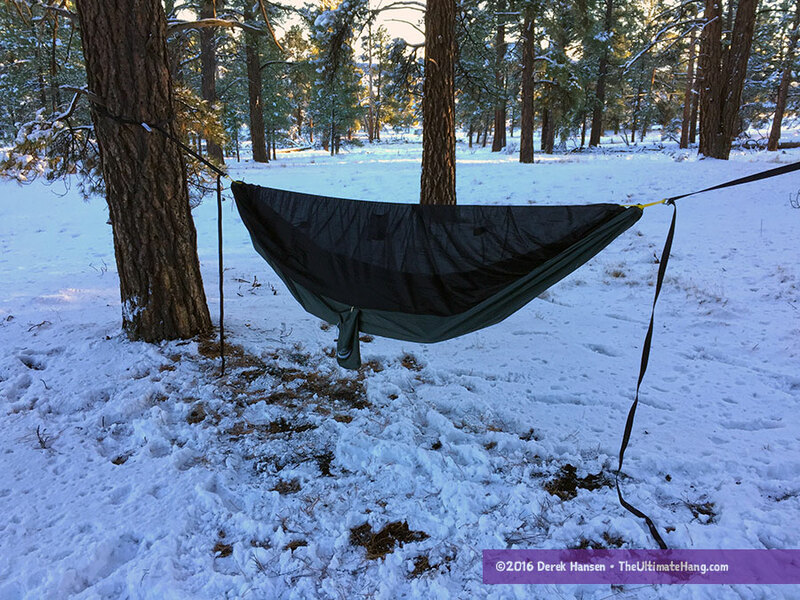 The integrated ridgeline on the hammock is a nice feature that not only helps keep the bug netting off your face without hanging up additional string, it also keeps the hammock for being pulled to tight. The bug net has been designed so that the hammock can be flipped over and used in a “nettles” mode, if you detach the ridgeline. The hammock can be fitted with a cinch buckle suspension system as an optional feature. The GO! Camping Hammock is a comfortable jungle-style hammock, similar to other mid-tier camping hammocks on the market and has a matching price point for entry-level hammock camping. The parachute nylon fabric is durable and matches what you will find on an ENO-style hammock on the market. The hammock has a few handy clip points on the hammock fabric — two on each side — that can be used to pull out the fabric, or clip points for an under quilt. The inclusion of a ridgeline is also a nice feature that is super helpful for beginners (and pros!) to help with setup with less fiddle factor. You can detach the ridgeline pretty quickly to turn the hammock into nettles mode by turning the hammock upside down. The fabric is durable and robust, including the bug netting, so I have less concerns in recommending this hammock to beginners or youth. Any tarp with an 11 foot ridge line would be adequate. You could go a little smaller or larger, but that would be the sweet spot. Thank you so much for the fast reply. I knew this was going to be a very helpful and informative site after just looking around a little. Things coming together then. UPS just delivered the hammock, my friend just dropped off a 10 x 9 tarp. If is doesn’t snow or rain tomorrow I am going to give a go at hanging the two. Not sure if I’ll get a chance to go camping for real but found the hammock on sale for $57 delivered and couldn’t stop myself from buying one. We’ll see if I can be convinced to get up off the ground in the coming years when sleeping in the woods.